The only communications platform you need to deliver extraordinary experiences. keyboard-arrow-right copy 4 Created with Sketch. No developer. No problem. 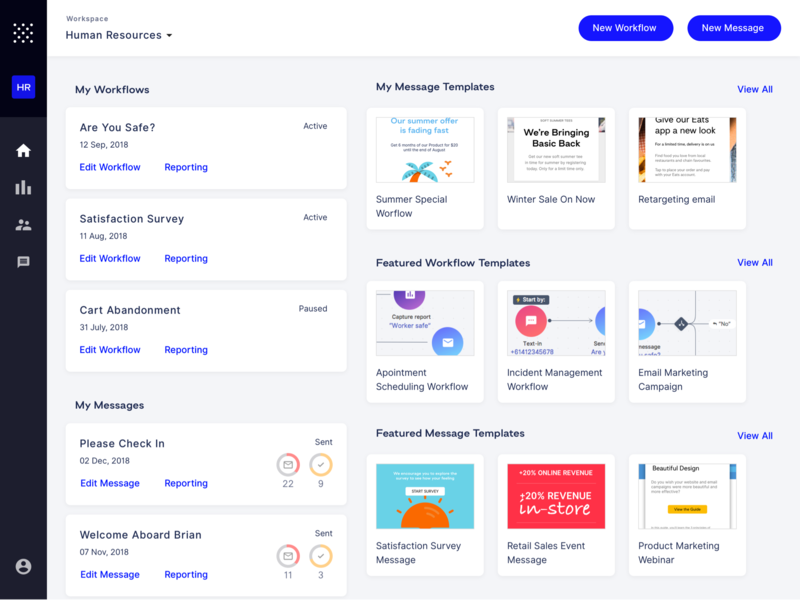 Create quality templates for email, web, social and more in minutes with our drag and drop template builder and over 60 individual components from images to maps. Streamline your communications and automate interactions, from everyday processes to complete marketing campaigns. Integrate with all your current data points from CRMs to 3rd party tools and put your data to work. Deliver your content to the right people at the right time. Create real, tangible outcomes that engage your audience, coordinate events and innovate your business processes. Whispir’s intelligent and powerful workflows will revolutionise your customer engagement, business resilience and operational communications process. Our intuitive workflow builder allows you to quickly and reliably automate manual business processes. Whispir lets you bring your ideas to life and create an automated workflow that is completely customisable to your business and use case. The possibilities are endless. Truly connect with your audience. Become a storyteller and bring people on a journey. Provide options and context, not just end points. Use that engagement to grow new revenue channels. Make your interactions intuitive and driven by data. Efficiently rollout processes and activities that can be tracked and measured at every step. Remove delays and errors that occur through manual intervention, and streamline with repeatable frameworks that scale. Put your data to work. Use our intelligent technology to advance, iterate and develop faster. Bring your business ideas to life quickly and turn on new revenue streams with minimal effort. Start your free 14-day trial of the whispir platform today. Features keyboard-arrow-right - Slim Created with Sketch. Whats new keyboard-arrow-right - Slim Created with Sketch. Marketplace keyboard-arrow-right - Slim Created with Sketch. Developers keyboard-arrow-right - Slim Created with Sketch.